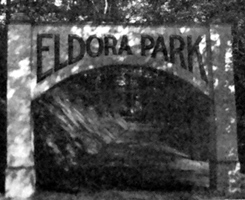 Eldora was laid out in 1901 by James A. Pahe with an amusement park which is popular among the people of Monongahela city. Since the town was first laid out additions have been made, the largest by John M. Wanner. Stockholders announce plans to open May 30. Stockholders elected directors William Henderson (President), Henry Sheets, D. E. Sloan, J. K. Tener (Treasurer), Tom. P. Sloan, W. W. Jimison, W. Piper, and John J. Oates (Secretary). The company was capitalized at $50,000 with $40,000 to be issued and $10,000 to be held as treasury stock. Five thousand people attend the opening on Decoration Day. Dancing pavilion open, but merry-go-round and roller coaster not running yet. New roller coaster dedicated. Merry-go-Round and other amusement will be open. Excelsior orchestra is in charge at the Dancing Pavilion. A NEW FERRY. Sutherland and Moss are Now Ready to Serve the People at Twelfth Street. Fred Sutherland and A. B. Moss start ferry service from Twelfth street in Monessen across the river to the Charleroi and Pittsburg street railway line  a short route to Eldora Park. Directors plan to spend $10,000 for new amusements and are considering a "Down and Out," a huge spiral tube, and an "Old Mill," a popular amusement recently introduced at Kennywood Park. WANT A LOWER RATE. Eldora Park People Want Street Car Company to Reduce Rate to the popular Resort. Efforts have been redoubled to seek a single fare from Charleroi and Monongahela to Eldora Park. The distance from both towns is three miles, but the street car company charges two fares from each town. Public sentiment is that the lower fare would increase patronage and make the street car more popular in the community. WILL GRANT FIVE CENT RATE. Officials of the Pittsburg Railway Company have Complied With Request. After a "vigorous crusade" waged by the citizens of Charleroi and Monongahela, and the stockholders of Eldora Park, the fare to Eldora Park has been reduced from ten cents to five cents. MERRY CONEY ISLAND AT PERCY PARK. Shute the Chutes, Scenic Railway, Laughing Gallery and Everything Festive at Shady Grove. Plans are completed for Shady Grove Park in Fayette county at Percy Station eight miles from Connellsville and five miles from Uniontown. West Penn Railways Company is preparing plans for a terminal near the park. W. P. Sloan, manager of Eldora Park will manage the new park. Edison Electric Theatre tent burned around 4:00. The fire originated from crossed electrical wires. All escaped unharmed, except for one employee who had his feet slightly burned. Piano and furniture were destroyed at a loss of about $1,000. The tent was owned by William McShefrey and F. McCullough of Pittsburg. Between 1902 and 1905, the best chance to see a motion picture in the Monongahela Valley was either at a short engagement at a local opera house, or in the summer in the special tents at amusement parks. 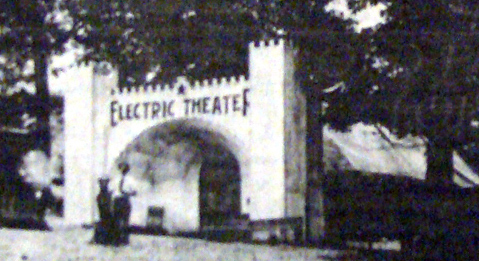 Eldora Park, the vanished amusement park in Carroll Township, offered its own Electric Theater, a black tent that showed movies for several summers beginning in 1903. George Campbell will remodel the Electric Theatre and add vaudeville as a feature in addition to moving pictures. Manager Tom P. Sloan and Assistant Manager Roy S. Sharpnack announce extensive improvements to the Park including a brick walk from the street car station to the dancing pavilion, renovations and repainting of all buildings, and additional lights strung. Click to see photos of the remnants of the brick walk. Buildings were purchased for $2,500. Large building to be used for sleeping quarters and recreation, another building to be used for kitchen and dining hall, and four-roomed-cottage to be used for the caretaker. The rustic lanes of old Eldora Park will echo to the glad cries of local Girl Scouts tomorrow when Charwood Day Camp Opens. A special car leaves each morning at 9:30 o'clock from First and Fifth streets, returning at 4 p. m. Stops will also be made at Allenwood and Lock View. Margaret Kornhi is director of the recreation project, Elizabeth Hogan chairman of the Camp Committee and Mrs. Elizabeth Staib chairman of the Day Camp. An average of 175 girl campers and a staff of 40. The Great Hall at the Eldora campsite has been named for the hall at the National Girl Scout camp Edith Macy, in New York. The walk from the carline to the camp has been named Colborn walk, in memory of the late D. L. Colborn, one of the first local men to help the girls obtain the present camp site.